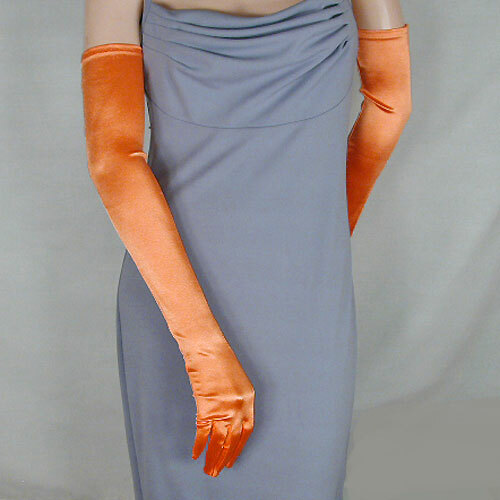 Long Satin Stretch Opera Gloves for Proms & Formal Events, Over 40 Colors Long satin opera gloves in over 40 colors. These evening gloves are 22 to 23 inches in length or 16BL and fit sizes 5-9. They are the most formal length and have a fiber content of 90% nylon or polyester with 10% lycra or spandex for great stretch. These beautiful opera gloves are the most popular choice for bridal parties and are fabulous for weddings, formal evening events, dinner dances, and proms. They work best with strapless or spaghetti strap dresses. Color: orange Hue: Code: #FF9900.